Leading off this week’s column: Lean processes and policies have found their way into many industries. Treston USA’s post focuses on a key question of whether Six Sigma should be implemented in electronics manufacturing plants. The experts at JBC Soldering Tools shared these valuable soldering safety tips. A must-read before your next project. Here's a cool post from 3D Printing Industry about how UK researchers have developed “smart bandages” that can track how well a wound is healing. It's NFL Draft season and Zebra Technologies’ post presents a story about how player tracking sensors and their related data are who your team will select. 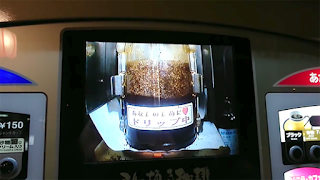 For those of you who are REALLY particular about your coffee, Laughing Squid shared this story about a Japanese vending machine that gives you a live view of your coffee being brewed. And we close out this week’s column with our blog about an awesome new Free Shipping offer on Quantum Storage Systems products. SPECIAL OFFER: Free Shipping on the Transforming Technologies IN6430 Ptec™ Ionizing Air Gun (No Filter). 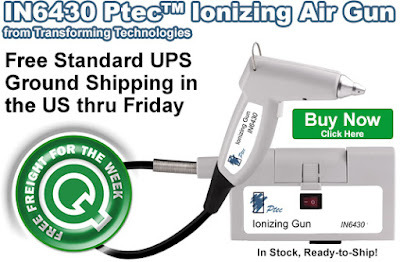 Save with Free Standard UPS Ground Shipping in the US when you add a Transforming Technologies IN6430 Ptec™ Ionizing Air Gun (No Filter) to your shopping cart. Our Free Freight Friday (FFF) promo is valid Monday, April 24, 2017 and runs through Friday, April 28, 2017. The IN6430 Ptec features a high-performance design that allows for easy set up and use and requires no calibration…thus saving you time and money. The unit uses a specialized piezoceramic technology that provides reliable protection of most static-sensitive devices. Please see the product’s page at QSource.com for further info. Follow our regular Free Freight and Featured Product selections on our Q Source Resource Blog, via our email newsletter, or on our social media accounts. Please help us spread the word about these great money-saving opportunities by sharing these offers with your friends and colleagues. Click here to shop for the Transforming Technologies IN6430 Ptec™ Ionizing Air Gun (No Filter). For further questions, call us (800-966-6020), or send us an email. Please note: This promo is valid only at QSource.com and expires on Friday, April 28, 2017. Leading off this week’s column: Grab your tools! It’s that do-it-yourself time of year and 3M’s post offers safety tips for your next DIY project. Are you slouching as you read this? Then you need to read Workrite Ergonomics’ post about the importance of good posture at work. Many people around the world depend on the desalination of water. Tektronix’ post looks at how researchers have created a better way of turning salt water into clean drinking water using graphene. Agilent Technologies’ sobering post delves into the question: Humans vs. spiders…who wins? 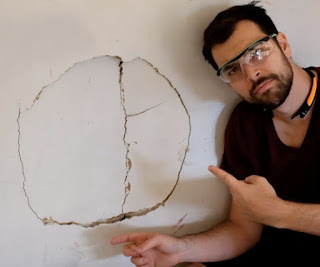 So, you’ve got a big hole in a drywall? We’re not asking questions, just recommending you check out this post from Instructables about how to patch large holes. And we close out this week’s column with our email post about our new Treston Buy 4, Get 1 Free promo. QSource.com offers more than 800 top-quality Quantum Storage Systems products and now you can get Free Shipping on all of them. Shop for bins, totes, conductive storage, accessories and more with this new offer from Quantum and Q Source. 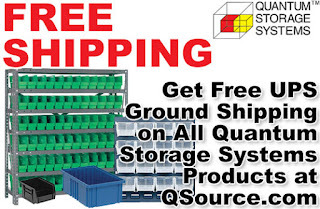 When you shop for Quantum Storage Systems products at QSource.com you’ll get standard UPS Ground shipping for Free. Hard to beat a deal that saves you shipping fees on great storage products. Please visit our Quantum Storage Systems page to purchase your bins, totes, and more. You may also contact us by phone (800-966-6020), email, or via our Web site. 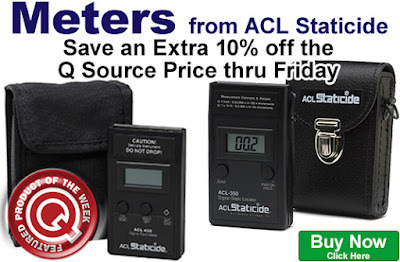 Save an extra 10% off the Q Source price on ACL Staticide Meters. Get this week-long discount when you add an eligible meter to your shopping cart. Our Featured Product promo is valid Monday, April 17, 2017 and runs through Friday, April 21, 2017. Eligible products include static locators, electrostatic field meters, megohmmeters, and surface resistivity meters from ACL. This promo features devices for measuring surface resistivity, resistance, temperature, and humidity for flooring and work surfaces. Click here to shop for eligible ACL Meters. For further questions, call us (800-966-6020), or send us an email. Please note: This promo is valid only at QSource.com and expires on Friday, April 21, 2017. Now through June 30, 2017, get a Free Treston LED Light w/the purchase of four. Your Free light is added to your cart automatically when you add four eligible lights. This Q Source limited-time promo is valid on eligible Treston high-efficiency, dual-intensity LED lights. These long-lasting light fixtures are available in a number of sizes and models. 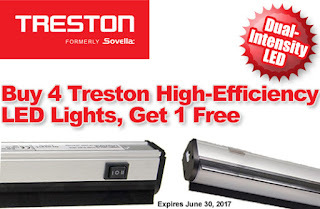 Please visit our Treston (formerly Sovella) Buy 4, Get 1 Free promo page to purchase your LED lights or for further info about our special deal. You may also contact us by phone (800-966-6020), email, or via our Web site. 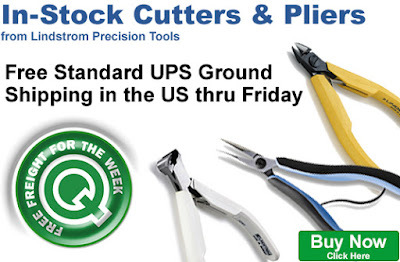 Save shipping costs on select in-stock Lindstrom Cutters & Pliers. Get Free Standard UPS Ground Shipping in the US when you add an eligible tool to your shopping cart. Our Free Freight Friday (FFF) promo is valid Monday, April 10, 2017 and runs through Friday, April 14, 2017. Eligible tools include cutters and pliers from the Supreme, 80, and RX Series; a selection of ESD-safe and standard models, various cutting gauge capacities, and various cutting types, head shapes, and lengths. Please visit the product pages for more detailed information. Click here to shop for eligible Lindstrom tools. For further questions, call us (800-966-6020), or send us an email. 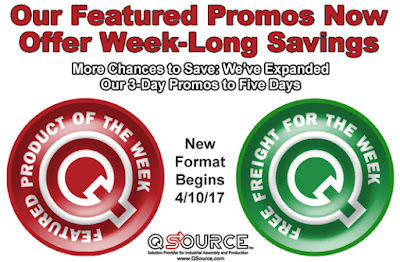 Please note: This promo is valid only at QSource.com and expires on Friday, April 14, 2017. Home owners invest thousands of dollars every year on home upgrades. A common upgrade on an American home is the addition of an outdoor deck for enjoying leisurely time with family and friends. 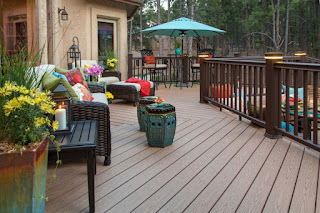 Outdoor decks are easy to build and maintain, but one commonly overlooked factor is that new decks made from plastic composite material generate static electricity. Static electricity on decks can occur when dry climate and low-level humid air combine with dust particles that lay on deck surfaces. This potentially dangerous static electricity becomes a nuisance through the first years, unless the deck is treated with a topical anti-static solution. 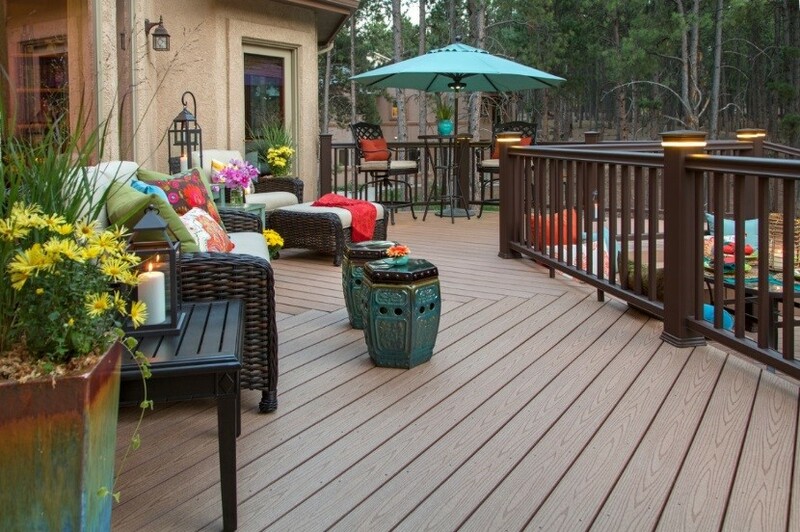 As an alternative to wood, insulating materials such as plastic composites are often used in these decks. The peculiarity about insulating materials is that they hold in electro-static charge, until electrons get excited by friction, and static is then transferred onto another object. Typically, the manner in which a person walks, e.g., scuffing and friction of the shoes against the floor, or the action of brushing against furniture, even sitting and rising from seats, are ways in which people on decks get electrostatically charged. If a body becomes charged, it is only a matter of time until it discharges onto a grounded source such as a railing, a door knob, or another body as they come in contact. An electrostatic discharge (ESD) on a person may range from a mild to very painful shock. 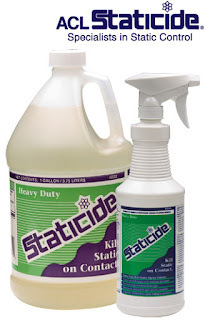 One solution for this potential nuisance, ACL’s Heavy-Duty Staticide® is used as a maintenance product for eliminating static from composite decking. This product is a non-toxic, topical anti-stat that leaves behind a surface-active residual substance that washes away with water. Since this product is not a permanent coating, reapplications are advised after weather conditions such as rain or snow. Because static generated from composite materials decreases as the material ages, the recommended product application is regularly throughout the first year, and periodically after that, if necessary. For further information about this product, please visit QSource.com. Leading off this week’s column: Tektronix has this cool post about a new liquid chemical that can store and transport solar energy on demand. JBC Soldering shared this interesting piece about how researchers have potentially discovered a new way to cool tiny chips for smartphones, computer, and more: graphene. If you have employees who are on their feet all day, you may want to check out Wearwell’s blog post about how anti-fatigue mats can reduce pain and stress while increasing productivity. Spooky particles? Yep, that’s the topic of this NIST post that focuses on the “spooky” actions of particles of light AND particles of matter. If you read this Laughing Squid post, you must be very, very smart. 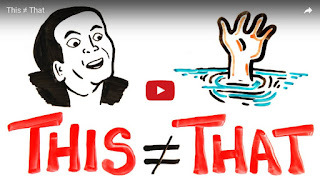 Okay, maybe not, but false correlation is exactly what this post is about. 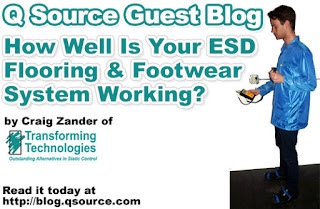 And we close out this week’s column with our email post entitled: How Well Is Your ESD Flooring and Footwear System Working? We’re excited to announce that our weekly Web promos, Featured Product Friday (FPF) and Free Freight Friday (FFF), will now be extended to last for a full week instead of just a weekend. The Featured Product promo offers significant savings on a new, popular, or best-selling product every week. And the Free Freight promo offers Free Standard UPS Ground Shipping (in the US) in a similar fashion. The new week-long promos will debut Monday, April 10, 2017. To claim the Featured Product/Free Freight promo pricing, customers only need to add the eligible product(s) to their cart and the discount code or Free Shipping will be automatically applied at checkout. The savings become valid beginning at midnight on the Monday of that week’s promo through that Friday until 11:59:59 p.m. These discounts are unlimited; customers may use them as many times as they want for as long as that coupon is valid (unless otherwise noted). Please note: These promos are valid only at QSource.com. Each week’s Featured Product/Free Freight promo will be announced via our blog, email newsletter, and social media. We encourage our valued customers to check out those resources and to visit QSource.com on a regular basis for the latest offers (look out for our FPF/FFF logos). We also encourage sharing of the Coupon Codes—we want a wide audience to be able to take advantage of these special savings—let your friends and colleagues know! For further questions about these Featured Product promos, please visit our Web site, call us (800-966-6020), or send us an email and one of our experts will be happy to help you. Remember, these new week-long savings opportunities begin 4/10/17.